About the interviewee: Trevor Betenson is the chief financial officer at Palo Alto Software. For instance, sometimes the company’s files got corrupt when they were upgrading to the new version. It seemed like we always had problems during the upgrade process that were disruptive and annoying. Maybe it was because of how we had QuickBooks Desktop installed on our server, or user error in getting files ready to be upgraded and transitioned, but there always seemed to be problems with the upgrade process and I was always on the phone with Intuit and their support team trying to figure things out. That was the biggest thing that I didn’t like about it. Along your way in your path of transitioning, did you consider QuickBooks Online before, but not end up making the switch? What kept you from transitioning sooner? Yes, I had looked at QuickBooks Online, as well as other software solutions. I try to keep my hands on the different accounting solutions that are available in the market so I’m making sure that I’m making the best decision for our company. I had checked out QuickBooks Online several times. I reviewed it most recently about a year before we switched. At that time, the most important roadblock to switching to QuickBooks Online for me was the inventory management. We’re predominantly an online software and service company, but we do have a portion of our sales that come from our legacy boxed software sales. So, the inventory management for me at the time was a roadblock. We sell at Amazon, Staples, and OfficeMax/OfficeDepot, and we’ve sold at Costco. We have inventory and we have different fulfillment warehouses. We have hard goods components and we have to build assemblies. That was the main reason we used QuickBooks Enterprise. It did a better job of the multi-locations for the inventory management, versus the Premiere or the Pro version. 18 months ago, when I seriously thought about switching to QuickBooks Online, the inventory just didn’t have the features that we needed to do the multi-locations and the build assemblies. At that time, I just decided it wasn’t ready and wasn’t time for us to switch. Why in the end did you decide to make the switch? What changed your mind? One of the biggest reasons I changed my mind came after using QuickBooks Online for my personal finances. I’ve used Intuit products, mostly QuickBooks for the past probably 12 or 13 years for my personal finances. QuickBooks Desktop always worked fine, but as I remember there was one day where I needed to find a transaction and that file was on my home computer. I don’t have a VPN to my house, and I didn’t have a way to get it. It was just frustrating that I couldn’t access that information when I wanted it and needed it. I always used an older version of QuickBooks Desktop. I didn’t need it to be up-to-date for my personal finances. However, after that pain point moment, I decided to just give QuickBooks Online a test and do the free trial. I connected my bank accounts and my credit cards, and played around with the imports and the reconciliation, and was really excited by how I could have the information wherever I was, whenever I needed and wanted it. I didn’t have to spend hours every month entering receipts, and I didn’t have to spend hours a month reconciling bank accounts and credit card statements. It just made things simpler for my personal finances, and that’s when I decided to have another look at switching our company. At that point did you figure out a solution for the inventory management issue you mentioned was the biggest problem for Palo Alto Software to switch to QuickBooks Online? Yes, after really looking at our processes I decided that managing our inventory in QuickBooks Online wasn’t as important as having access anytime, anywhere, with no upgrades to deal with, and no single user/multi-user issues to deal with. We work with a really good supplier that does all of our warehousing and our fulfillment, and I realized we could rely on their system for inventory. Every company is different; manufacturing, for instance, has very specific financial requirements. If you’re an online retailer, there are applications like Square or others that could manage financial transactions. It just depends on how you want to use QuickBooks. I really think there’s a great way for most companies to work with and use QuickBooks Online effectively. The benefits that you get from the online access and true multi-user collaboration make up for so much. Are there companies for whom QuickBooks Online is still not the right fit? I think inherent with any web application at times, depending on your internet speed, there can be slowness. That’s usually more of a function of your internet bandwidth speed versus the speed of the application. Installed software, if you’re just spending all day long entering invoices or bills or receipts, could be slightly faster than software that is hosted on the cloud. For us, the majority of our transactions are tracked in a different system. Even with QuickBooks Desktop, we weren’t entering every single sales receipt or every single transaction. We were doing bulk entries daily and my choice to switch to QuickBooks Online really didn’t affect that. We had to change some of our workflow, but most of the changes have improved our process. It makes it really easy to connect to the banks and the credit cards. We played around with how that worked, and tweaked some of our processes so that it worked within the confines of how QuickBooks Online works. One of the things I’ve learned is that QuickBooks Enterprise has had many years to develop and create features, and to fine-tune those to work for a lot of different companies. QuickBooks Online, I think, has a different philosophy. Instead of waiting for it to launch where it had every single feature, they’ve tried to really make the core features of accounting work really well. They are giving more freedom to the app developers, the private third-party ones that can connect to it. They’re opening QuickBooks Online, to make it easy for great third-party applications to work with it. For example, the inventory issue that I mentioned is now solved by various third party applications, that connect to it and can do multi-locations, and can do build assemblies. Depending on how you set things up, third party applications can either push things to QuickBooks Online, or can pull things from QuickBooks Online. Can you sum this all up by explaining, just in general, what QuickBooks Online does really well? What do you love about it? Have there been specific improvements to your day-to-day from making the switch? Yes. Definitely, I think the main change day-to-day is I can look and see instantly information across multiple bank accounts and credit cards. Instead of me logging into five different bank accounts, I can log into QuickBooks Online, update the files, and I can see our current bank balances all in one spot. It gives you that real-time view of all your financial information, instantly from anywhere, something that QuickBooks Desktop just doesn’t do very well at all. Having real-time information from online connection to our financial institutions, rather than having to import information in like you do for QuickBooks Desktop is invaluable. It’s one of the day-to-day improvements that immediately made my life as a CFO easier. I also like that I don’t have to be at my computer, or VPN into the QuickBooks Desktop instance on an internal server. If I’m not at the office and I happen to not be at my computer, I can login from anywhere. It has a mobile app that I use to get balances and I can look at things quickly, when I am on the go. Depending on your clients, it can create invoices from that mobile app, which if they are doing things out of the office and need to create an invoice on the fly, works really well for them. QuickBooks Online also integrates really well with billing applications like Bill.com, if an accountant or company wants to use something like that to do billing outside of the system. All of these integrations, and real time connections with banks and credit cards, make month-end reconciliation so simple and quick. Depending on the account, we reconcile daily, or weekly. But, at the end of the month, within a day or two, everything is reconciled. Whereas before using QuickBooks Desktop, reconciliation was a very manual process, which we had to wait and do at the end of every month. Our company has a lot of transactions every day, which means that having an easy method to reconcile daily makes the month-end process much quicker. That’s great. Thank you so much for your time. Is there anything you’d like to say in conclusion? The only thing I would say is that if you haven’t actually tried QuickBooks Online, then I would urge you to give it a try. I think a lot of accountants I’ve talked to who say they can’t switch their small business clients to QuickBooks Online say, “Well, it doesn’t have enough features,” or, “It doesn’t do this or that.” Usually I ask them if they’ve actually tried it, or if it’s just from what people have said. Or, if it’s from past experiences. Most of the time I hear people say that it’s what they have heard, or that when they looked at QuickBooks Online two years ago, it didn’t work. 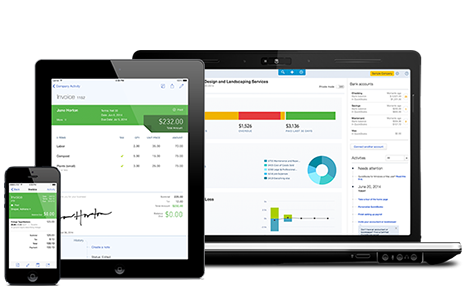 Intuit has really developed a lot of great features for QuickBooks Online in the last two years, and they have also really cultivated the third party application landscape. I would encourage these people who hesitate to just give it a shot. For me, it took connecting my personal stuff to it, just to see how beneficial it could be. By giving it a test run, I was able to understand how much the change could benefit Palo Alto Software. That’s probably my biggest piece of advice: If you haven’t tried it, give it a try. If you’re working with your clients, I know that you will find a lot of great collaboration features that make working with that client easier; you have the right information right at your fingertips anytime you want it. Your small business client also has the right access from anywhere and can more easily get access to what they need, no matter what time of day or night it is. If a user is curious about updates to the product, I believe Intuit has a lovely blog that shows all their monthly updates to the product. Yes. Similar to LivePlan where we have short development cycles, and we release new features often. Now, it’s three to four weeks and there’s continuous improvement on the product. The nice thing about using QuickBooks online is that you just log in and all the new features are there. The product doesn’t have to remind you to install it, or to update it. You don’t have to consciously do anything. You always have the most up-to-date version of the software. For the latest updates and news on QuickBooks, take a look at their blog.